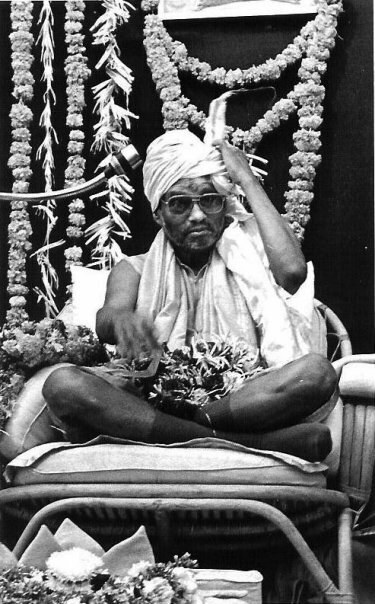 From Swami Nirmalananda – I hope these many blogs have helped all of you enjoy the pilgrimage with us! While India is a place on the outside, it is also a place on the inside – a holy place, the space from where your Self shines. If our trip has helped you find your vast inner spaciousness and Beingness, then we have served you well. And had a great time doing it! If you’re thinking you’d like to come along next time, I’m planning to do a trip every 2 years – look for early 2015! This entry was posted in Ganeshpuri, India, Meditation Teacher, Svaroopa Vidya Ashram, Swami Nirmalananda on April 2, 2013 by Svaroopa Vidya Ashram. “Next time you see Swamiji would you please ask her how I can die and leave my body? I am ready to go and I can’t,” asked Elmira, who at 102 was still fully functioning mentally, but deteriorating in her physical body. She was done with her body. A spiritual being of the highest degree, she was ready to go and be with God. She was done with her earthly existence. I had been sharing my experiences with her about Svaroopa yoga and Swamiji, and she loved hearing about it. I agreed to ask the question of Swamiji, so I emailed her, and within twenty minutes I received back the most beautiful letter for me to give to Elmira. While I can’t remember the details of the letter, Elmira memorized it. In general, Swamiji told her that she was already God and to be with herself in this knowing while she remained alive. She shared words that Muktananda had taught her. It changed Elmira’s life. She stopped wishing to die, and to accept each moment for the gift that it was. She shared the letter with everyone. She wrote Swami, and at some point Swami said that she kept the letter out on her desk, it was so special. She sent me home with a mala bead for Elmira and a mantra. Elmira insisted on putting it right on, much to the dismay of her nurse who had to undo all her breathing apparatus. Elmira was looking forward to hearing all about India, but she died on the day I came to India with Swami. During the morning ceremony in Nityananda’s temple, she told me she had died. How incredible that I was able to say goodbye to her in Nityananda’s Temple. What a gift for me to say goodbye to her there. Then we came to the Kumbha Mela and went by boat to the Sangham, the holy site where the three rivers converge. I had a puja done to bless Elmira. The puja took place on a boat with a Brahmin priest, who had us repeat mantras and gave us coconuts and flowers. After the mantras were finished, we released the coconuts and flowers into Ganga with our own prayers. Mine were blessings for Elmira. I feel her presence here every day. Good bye and hello. It is not an end. Only a change. When Swamiji had sent me the letter for Elmira, at the end she wrote a note to me, “She’s ready to hear this, are you?” Those words stayed with me. After these three weeks I can finally feel that I am ready. The changes inside are profound. I am one with the Guru, I am the Guru. I receive grace from my Guru. I receive all I need from my Guru. I just have to stay open to hear it. It is all inside. It does not come from the outside. I don’t need my asana to have it; I don’t need my OM necklace to hear it; I just need to be in me. That will be my challenge when I leave India. Staying open. I hope I am up for the challenge and trust that I will do my best, just like Elmira, who, at 102 was ready to hear and live by what Swamiji had to say to her. It’s been over 2 weeks since our return from India. It’s become apparent that some of the changes, those internal changes, have become part of who I am now – parts of my personality seem altered. It’s also clear that the freedom of our journey, during which time we were so completely cared for, was wonderful but was defined by time. There was a part of me that never wanted to return and I keep that part in India; I have many memories to access along with over 1700 photos for when memories become foggy. I have given a lot of thought to our India experience. There is India herself: colorful, joyous, dirty, dusty, and sometimes sparkling clean. The sights, smells and sounds still resonate. Ganeshpuri, so full of Nityananda and Muktananda that grace seeps through the dust and is found in every breath. The Himalayan Institute campus on the Sangham, with energies so ethereal and powerful they draw even the uninitiated into meditation. And Varanasi. Varanasi almost defies description; it is such an area of contrasts. 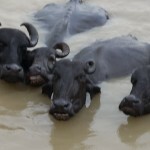 The steep steps of the ghats, each section with slightly different rise and fall, the cows and water buffalo, sadhus, foreigners taking photos, including a large boatload of tourists wearing medical face masks, each camera boasting a 6- to 10-inch lens. The goats, monkeys and piles of dung on the walkways, laundry stretched out on the ghats drying in the sun. Hundreds of boats and boatmen, priests, temples and people and traffic everywhere. The silk shops and veggie sellers, souvenirs, statues, incredible smells of food from street corner stands, the paneer shop, tailors in their dark shops creating clothing or weavers creating beautiful silks. And over all is the Ganges, and the thousands of bathers coming to cleanse themselves in her sacred yet alarmingly polluted waters. All of this is spectacular, phenomenal, enticing and exciting. More important, however, is that special aspect of our journey, the glue holding all together. Making it so much more than a mere trip to India was Swami Nirmalananda and the teachings with which we were daily graced. Each experience was looked at and questioned. Swamiji taught us to look beyond the external into the internal. What was really happening in Ganeshpuri, at Kumbha Mela? What is the meaning of all of our experiences? What did we see and what was there that we weren’t seeing? What could we feel? What did we know that we did not recognize we knew? This expansion was not what we expected and yet it profoundly affected each one of us and we were each aware of our changes. India herself cannot make me more patient, forgiving, understanding, compassionate. India could not propel me into my now daily chanting of the entire Guru Gita or to my each morning rise to meditate at 4 AM. India did not open my eyes to what is happening inside myself, she did not cause the river of Grace flowing within me, within each of us. But a month in India or a month anywhere with Swami Nirmalananda – now that is a life changing experience. 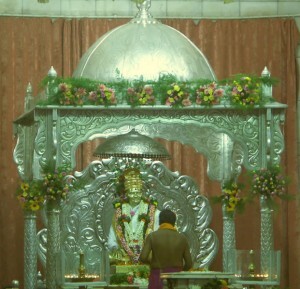 This entry was posted in Ganeshpuri, India on March 25, 2013 by Svaroopa Vidya Ashram. ● Swami Support: Goal $15,000 to provide for Swami Nirmalananda’s personal and professional support. ● Ashram Essentials: Goal $10,000 to support our ongoing programs and the facilities that are available to you. The Ashram Board is gratified at your support, not only for your generosity but also for your heartfelt message that Swamiji’s work is important to you. Our Capital Fund still needs your support, with $6,800 giving us a start toward our goal of $35,000. These monies are dedicated to replacing our Ashram furnaces and building the Outdoor Temple that Swamiji has designed. GAS FURNACES: The Ashram building is heated by natural gas but the furnaces are almost 30 years old. While they are a good ecological option, they are inefficient and they heat the building very unevenly. Thus we need to use electric heaters to ward off the chill in several corners, including our Meditation Hall. We’ve made it through another winter with these furnaces, but hope to replace them in the off-season, a lower priced alternative to waiting for a crisis to occur. OUTDOOR TEMPLE: Swami Nirmalananda would like to get outside for the sunrise! The backyard temple is designed for the morning chant and meditation, and can be used for almost three seasons. She’s designed a sacred center with eight points, corresponding with her Guru’s mystical teachings on the heart chakra, and plans to install a sacred statue from India there (in 2014?). The outer portion will be four-sided, the square of muladhara chakra, grounding the tailbone in physical reality. Our landscaping plan includes a fern garden and a water feature. A multi-year project, we hope to build the gazebo this year. The Board works to create the Ashram infrastructure and oversee it, understanding that every penny that is spent is your money. Our team of Board members and sevites reviews every expenditure closely and assists Swamiji with ongoing management. 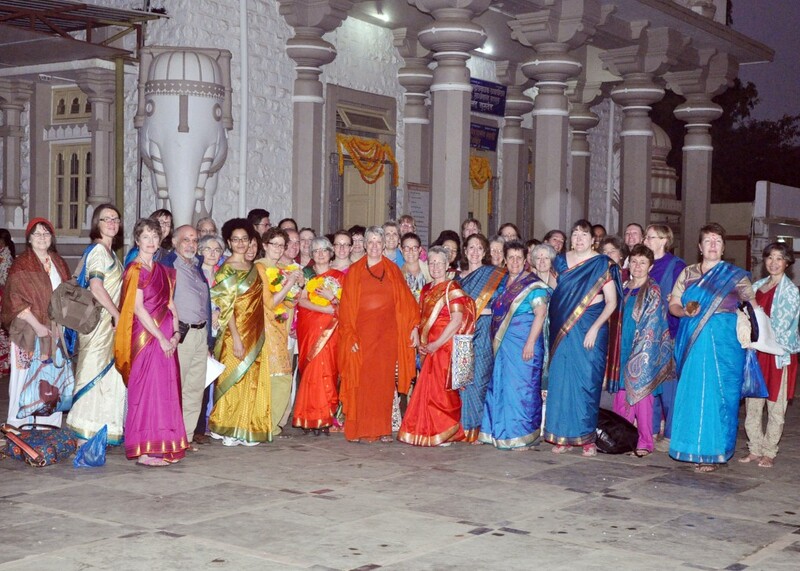 Our many sevites team with our administrative staff to keep personnel costs low so that your donations are put to careful use, along with the tuitions from Swami Nirmalananda’s courses and retreats. In addition, the Ganeshpuri Music School continues to be supported by the Ashram. Your financial support makes her able to dedicate her time to writing and teaching, as well as invite your participation from your home or when you are in Downingtown. Click here to offer your donation, in any amount, as a single donation or monthly gift. Thank you! Monthly Donors – please accept our loving thank you for your continuing support. Click here to add to your monthly dakshina or to make any other change. As announced in Tadaa! (page 4) new Monthly Donors and those who increase their monthly gift will receive Swamiji’s gift of a marble box from the Taj Mahal filled with sacred ash from our Ganeshpuri yaj~na (Vedic fire ceremony). This entry was posted in Ganeshpuri, India, Svaroopa Vidya Ashram, Swami Nirmalananda on March 20, 2013 by Svaroopa Vidya Ashram.